Wide Selection of Gourmet Gift Baskets On-Line - Custom Orders Welcome - Call 614-296-6031 Today! In the business of gift giving... In the art of gift giving... When the ordinary just won’t do. A la Wiskets specializes in creating unique custom gift baskets for its personal and corporate clientele. 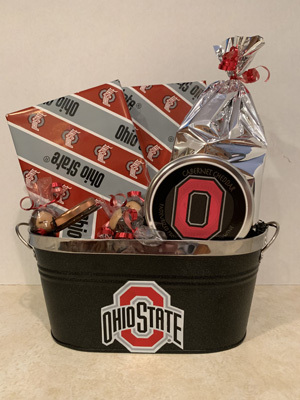 Our diverse selection of gift items is constantly being refined to assure that we provide you with a customized gift basket that will appeal to the most discriminating gift-giver. Artistic and affordable, our gift baskets are a gift-giving alternative that can be created to accommodate any budget. Choose from an array of pre-arranged gift baskets, or allow one of our helpful associates to assist you in developing a custom gift for any occasion. Gifts can be delivered nationwide. Our Privacy, Refund, and Cancellation Policies. Voss water or tea and coffee. Call for price adjustment. Thanks so much! My friend got her basket, loves it and sent me a picture. Looks great! It was a pleasure doing business with you, and I look forward to placing an order with you again sometime. I just wanted to ty for doing such a good job with the OSU tin you sent my bestie. She loved it and sent me a pic! It looked awesome :) Ty also for adding in the champagne and tattoos! I will definitely be using you in the future for all of my gift needs I need sent back home. My husband and I love the plates. Thank you so much for going the extra mile so that we could have them. I want to let others know about your excellent customer service!